Pronghorn have some unique adaptations for their existence in open country. These adaptations allow them to be the fastest mammals in North America. They have been clocked at nearly 70 mph and they can obtain and maintain speeds of 30 to 45 mph for fairly long distances. Historically, pronghorn were extremely numerous throughout the west, but agricultural development, cattle grazing, and construction of fences drastically reduced their populations. 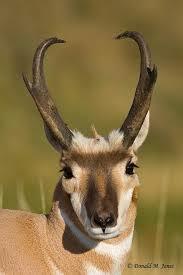 Pronghorn generally do not jump fences. Consequently their daily movements, and even seasonal migrations, have been blocked by fences. Some pronghorn do crawl under fences but require fences with a bottom wire at least 16 inches off the ground for effective passage. A year-round resident population of pronghorn (approximately 25) utilizes the BRWMA and portions of Harris Ranch. They are most likely found on low slope areas and gentle rolling hills from the black cliffs to, and perhaps beyond, the Table Rock area. They seem to prefer wide open, expansive rangeland with vegetation less than two feet in height. They are often found in low shrubs such as sagebrush and grassy vegetation in arid regions with less than 10 to 12 inches of snow on the ground in the winter. This may lead them to upper, wind-swept slopes in the winter, or fairly long migrations between summer and winter range. In the winter, southern Idaho pronghorn depend heavily on twigs, young shoots, and, especially, sagebrush. Their home ranges vary in size, but an Idaho study (Autenreith et al. 1975) found summer home ranges averaged about 8 square miles. Home range of yearlings was two to five times greater than adults. Large herds form in the winter but disperse in spring and form separate bachelor and female-fawn groups in spring and summer. In Idaho, pronghorns typically migrate to lower elevations in winter and move back to the heads of mountain valleys in the spring.